The intake air temperature sensor, in the mass air flow meter, monitors the intake air temperature. The intake air temperature sensor has a built-in thermistor with a resistance that varies according to the temperature of the intake air. When the intake air temperature becomes low, the resistance of the thermistor increases. When the temperature becomes high, the resistance drops. These variations in resistance are transmitted to the ECM as voltage changes (see Fig. 1). 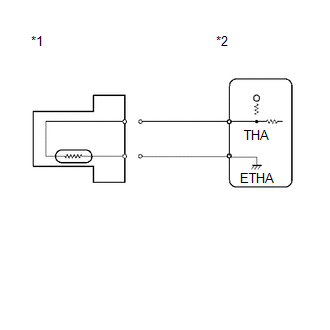 The intake air temperature sensor is powered by a 5 V supply from the THA terminal of the ECM, via resistor R.
Resistor R and the intake air temperature sensor are connected in series. When the resistance value of the intake air temperature sensor changes, the voltage at terminal THA varies accordingly. Based on this signal, the ECM increases the fuel injection volume when the engine is cold to improve driveability. When any of DTCs P0112 and P0113 are set, the ECM enters fail-safe mode. 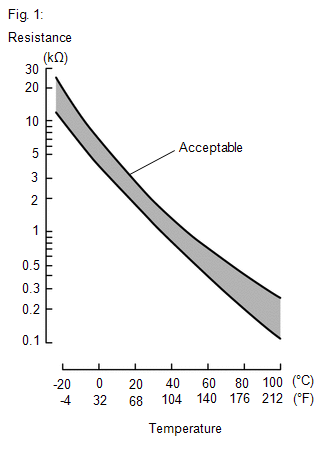 During fail-safe mode, the intake air temperature is estimated to be 20°C (68°F) by the ECM. Fail-safe mode continues until a pass condition is detected. When any of these DTCs are set, check the intake air temperature by entering the following menus on the Techstream: Powertrain / Engine / Data List / Intake Air. The ECM monitors the sensor voltage and uses this value to calculate the intake air temperature. When the sensor output voltage deviates from the normal operating range, the ECM interprets this as a malfunction in the intake air temperature sensor and sets a DTC. 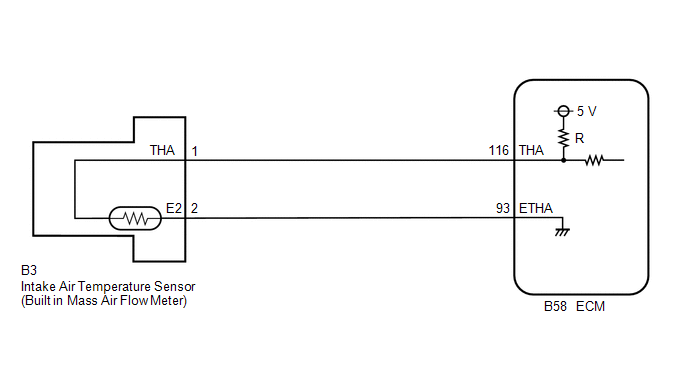 If the sensor output voltage is more than 4.91 V for 0.5 seconds or more, the ECM determines that there is an open in the intake air temperature sensor circuit, and sets DTC P0113. Conversely, if the output voltage is less than 0.18 V for 0.5 seconds or more, the ECM determines that there is a short in the sensor circuit, and sets DTC P0112. Input the DTC: P0112 or P0113. (d) Enter the following menus: Powertrain / Engine / Data List / Intake Air. Same as actual intake air temperature. If there is a short circuit, the Techstream indicates higher than 128°C (262°F). (a) Confirm good connection at the mass air flow meter. (b) Disconnect the mass air flow meter connector. (c) Connect terminals 1 (THA) and 2 (E2) of the mass air flow meter connector on the wire harness side. (g) Enter the following menus: Powertrain / Engine / Data List / Intake Air. (a) Disconnect the mass air flow meter connector. (e) Enter the following menus: Powertrain / Engine / Data List / Intake Air.